Everyone around me was holding on for dear life. They clutched nearby handrails and leather seats with one hand while gripping their expensive cameras, scarves and handbags with the other. Their heads smashed up and down to the rhythm of our boat crashing against waves of the Mediterranean Sea. The crackling sound of the wind slicing through the cabin was so loud that our attempts to scream at each other fell on deaf ears. The captain looked gravely concerned. He had lost control. It was his job to get our multi-million-euro yacht to shore safely, not to mention all the journalists on board back in one piece, and right now both seemed in jeopardy. What started as a routine test run in the Gulf of Trieste had quickly turned into his worst nightmare. For starters, he was no longer driving our yacht; I was – a 27-year-old journalist with approximately zero seconds of boating experience before this moment. In fact, I didn’t even hold a valid driver’s license in my home country. The second problem: we were careening through the water at 28 knots (around 52km/h), with the throttle pushed all the way forward. Ports in Italy, Croatia and Slovenia were just a short ride away, but was I going anywhere? No. Other ships in the vicinity had given us a wide berth ages ago, and what they saw in the distance would have no doubt looked like a five-year-old driving a billionaire’s toy. Left, right, left and right again with no direction or purpose at all. Aside from actually handing the keys to a five-year-old, there probably wasn’t a more dangerous person to give control of a Monte Carlo Yachts 86, one of the Italian shipbuilder’s most popular yacht models. The captain’s concern was warranted. As was his similarly disturbed face when every other journalist in our group took the wheel and pulled the same kid-in-a-candy-store routine with the extremely valuable piece of machinery he was supposed to return unharmed. But the drama felt worse than it actually was. In reality, the risk was minimal. The waters that day were calm, the sky was clear and modern superyachts like the MCY 86 are so well designed that even imbeciles like us can drive them safely – for the most part. A collection of Monte Carlo executives was on board that day too, and this wasn’t their first time watching a crew of completely inexperienced sailors gleefully take the reins of one of their award-winning boats – it’s part of the sales pitch. “When it comes to understanding the comfort and lifestyle options a boat like this can provide, these test runs are very important,” says Fabrizio Iarrera, Monte Carlo Yachts’ managing director. Sea tests – of a lesser intensity than ours – are standard in the yacht industry. Every company offers them because no one is going ink a multi-million-euro cheque without playing around a bit. With that said, Monte Carlo’s ability to sell its particular flavour of luxury yacht over the course of its short eight-and-a-half-year existence has been somewhat remarkable. 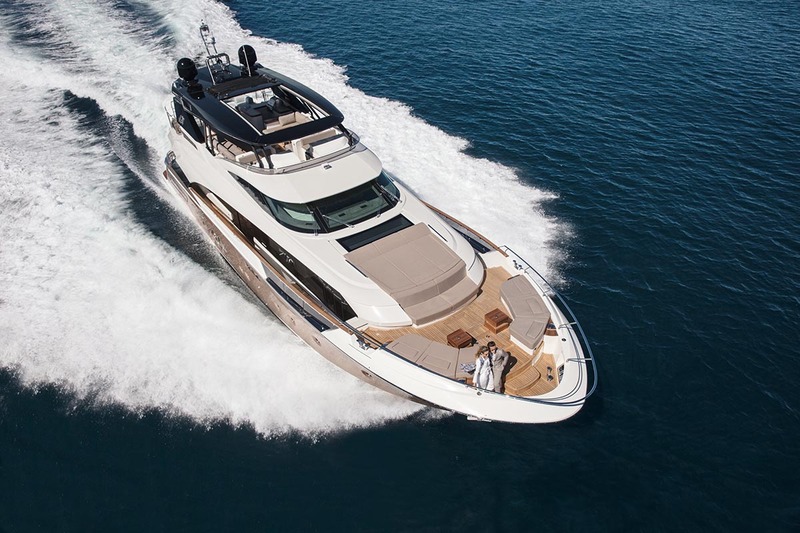 Since 2008, six of its seven models have earned major international awards from prestigious events like the Cannes Boat Show and the World Superyacht Awards. The MCY 105, its largest yacht in production, has won six major titles alone – most of them for design and innovation. The seventh and most recent addition to the family, the MCY 96, was only released in February and will likely have its own rack of trophies to add to the company mantle this time next year. Monte Carlo is also expanding its product category rapidly. Its year-over-year success has encouraged its 133-year-old parent company, Beneteau Group, to expand its facility in Monfalcone, Italy, to accommodate the construction of 130-foot superyachts – the largest boats Monte Carlo will have ever produced. Distinctive can seem like a throw-away term, but in Monte Carlo’s case it’s not. For the most part, if you want it and have the money to burn, Monte Carlo will build it for you. Nearly all yacht companies can claim this, however. What most of them can’t say is their boats are designed by Nuvolari & Lenard, arguably the world’s best superyacht design firm. You might not know the name, but you’ve seen the firm’s work. It’s the brand responsible for the legendary Alfa Nero, a US$190 million (6.3 billion Baht), 269-foot megayacht frequently sailed by Russian billionaire Andrey Guryev. Today, it remains one of the most iconic superyachts in history, largely because of the innovative design elements crafted by Carlo Nuvolari and Den Lenard, many of which are still mimicked by other firms. When the two aren’t dreaming up one-off uber-vessels for the world’s elite-of-the-elite, they help design Monte Carlo’s stable of award-winning “civilian” yachts – if there is such a thing – and are no-doubt a part of the renowned aesthetic that has made Monte Carlo so popular in Asia, particularly in Thailand. “Designing a small boat is can be much more difficult than a super yacht,” Iarrera says of Nuvolari and Lenard. “It was a challenge they were looking for, in terms of investment in the projects and also showing that they were perfect in this size. The other ace in Monte Carlo’s hand is its patented design process, which is a closely guarded company secret. None of us were allowed to bring cameras inside its facility when we visited, for fears that even out-of-context photographs might give competitors clues to mimic its technology. What we are allowed to say is that all Monte Carlo yachts are built in three separate pieces (the bottom, middle and top), on separate assembly lines similar to the way cars are constructed. The three sections, which are built to have little more than a few millimeters of breathing room between, are then glued together – yes, glued – and moved to the water. Gluing together a boat might sound suspicious, but the brand’s safety record is on par with every other yachtbuilder in the world, and its patented assembly process allows it to build yachts in roughly half the time it takes other companies. World-class design, completely bespoke interiors and the shortest turnaround time in the industry? It’s a sale’s pitch that’s hard to beat. It’s no surprise that Monte Carlo Yachts is commanding a bigger piece of the international boating market every year, and it didn’t take long to sell us on the idea during our short trip to Monfalcone earlier this year, but I think the Mediterranean joy ride played a small role as well. Now I just have to scrape together a few million euros.